When it comes to donut selection, Chicago's glazed cup floweth over (remember that time we had a donut festival?). So we decided to bring in the big guns on this one: pastry crusaders Gehring Miller and Kristin Gehring of The Breakfast Adventures of Coffee Girl & Donut Boy, who sorted through their countless entries and handpicked 10 breakfast rings that should be on your Chicago donut bucket list. "Health bonus! The Banana Biscoff Pocket at Stan’s has fruit inside. Actual, recognizable fruit. 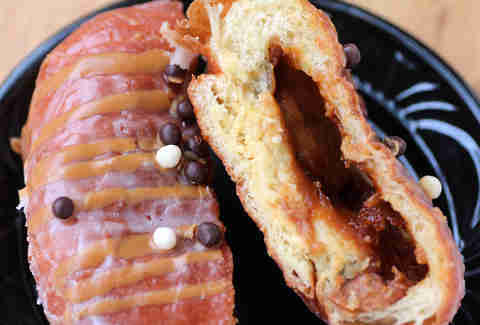 Sure, it shares its little cave with a sizable dollop of a European cookie spread, and it's housed inside a sinfully sugar-glazed donut, but shhhhhhhhh." 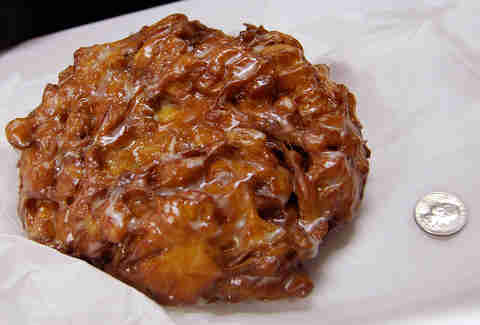 "Crunchy, sweet, salty, with tender bits of real apple and actual walnuts throughout, this apple fritter is the size of a catcher’s mitt. A delicious, delicious catcher's mitt. Oh, and if you think we're exaggerating, check out the quarter for scale." "This is the perfect donut to celebrate a Summer that feels like it would never get here. Beautiful, bright red strawberries atop a classic glazed donut with the kind of solid presentation you've come to expect from Roeser’s." "So what's a 'doughscuit'? It's like a donut, but it's made with their biscuit recipe, resulting in a decadently moist pastry which, when dripped with blueberry glaze and sandwiched around crème fraîche, melts in your mouth. Close your eyes and you’d swear it’s straight-up cheesecake." 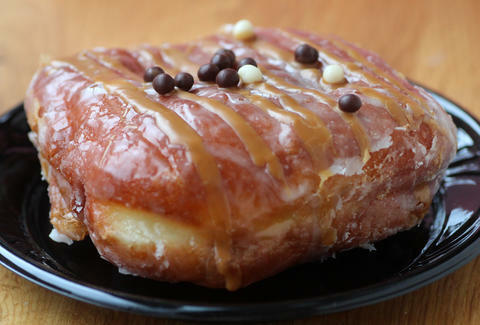 "You likely know about Glazed & Infused's maple bacon Long John, but don't sleep on Dinkel’s cake donuts -- their dough recipe recalls a nice pound cake, although not quite as buttery. 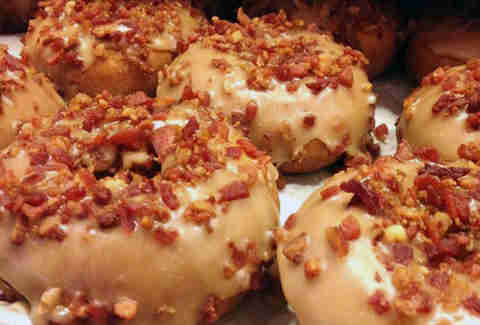 Here, baked bacon bits are stacked on top of a maple bacon glaze that'll awesomely remind you of a stack of pancakes." 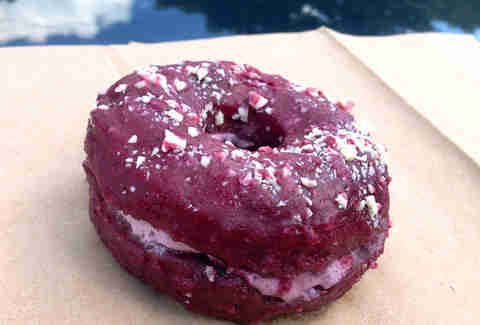 "The quintessential version of a classic donut. 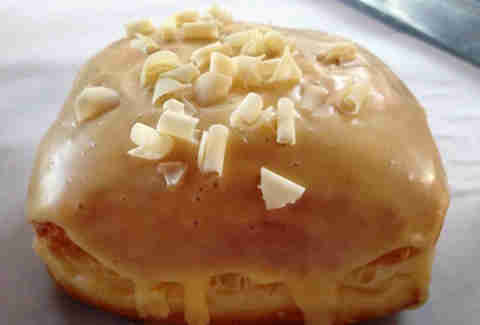 Creamy frosting on top of a crunchy-on-the-outside-but-moist-on-the-inside cake donut. Worth scaling Lake Shore Drive for." 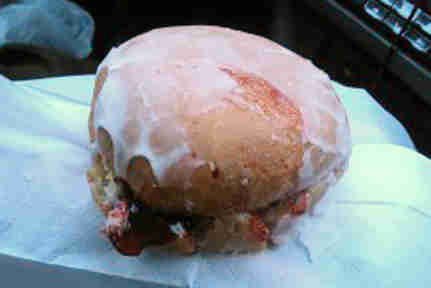 "There are jelly donuts, and then there are Abundance Bakery jelly donuts. If not having jelly in every bite is a concern for you (it definitely is for us), worry no more. 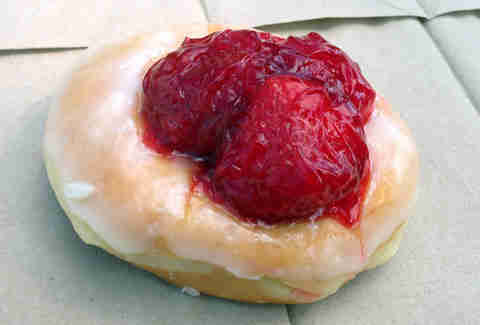 Fresh and strawberry-tastic, the jelly here is wrapped in a crunchy, sticky, glazed shell that will leave you licking your fingers all afternoon." "How do you feel about powdered sugar and lemon custard? Good? Good. 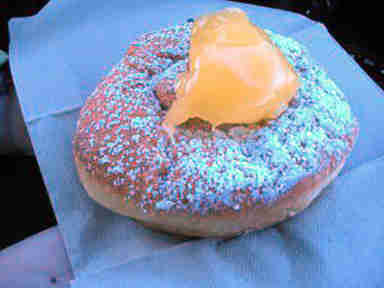 Then you gotta try the Lemon Donut at Dunk Donuts (note: it's Dunk, not Dunkin')." 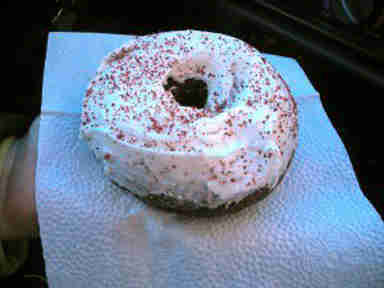 "You seriously cannot go wrong at a place with a donut drive thru. At press time, sources confirm their current Donut of the Month is S’more. So, yeah. Maybe go... right now?" "Glazed's Passion Fruit White Chocolate Donut caught us off-guard with the tangy sweetness of the forbidden fruit, before lofting us Heavenward with the smooth, white chocolate custard filling, then bringing it on home with a heartwarming, airy, glazed donut exterior. If you're not eating this right now, you're doing it wrong." 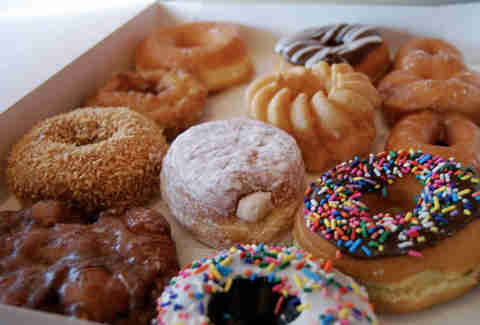 Follow the epic journey of Donut Boy and Coffee Girl at The Breakfast Adventures Blog.